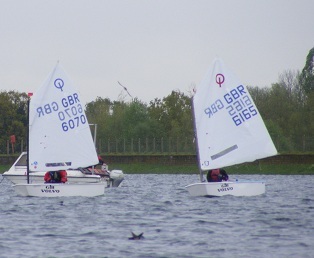 Saturday 5th May saw the 2012 Schools Open take place at Island Barn Reservoir Sailing Club in association with Epsom College. Firstly, apologies for the weather folks; persistent drizzle and arctic northerlies were not what was planned for May. However, there was a decent sailing breeze though and there seemed to be some interesting racing going on for those who could avoid the icicle fingers. Congratulations to Jess Hammett and Hattie Lucas-Clements from Tormead/St Catherines, who won the fast handicap in a Feva XL, taking first place in three out of the four races with some convincing wins. Second place went to Amy Cotter from WAG finishing with three seconds and a first place in her Laser Radial. 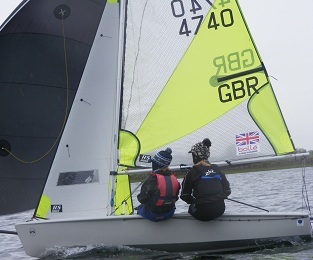 Best placed IBRSC sailors were Harry and Pippa Phelps finishing overall 4th sailing a RS Feva. In the slow division there was a hard fought four race battle between Jack Lucas-Clements from Cranmore, and James Hammett in their Optimists. In each race only seconds split the two boats. The overall prize was taken by Jack only by winning the last race and only by 1 second from James, it really doesn’t get much closer than that! Third place was taken by Tom Booker from Downsend leading the charge from the Topper fleet. Matthew Curtis from IBRSC finished 6th. Photos: a couple of us took a bunch of photos which you may have seen on the screen in the club. The weather and wind conditions weren't really conducive to producing Yachts and Yachting cover standard images, but if you would like a copy email me using this link, and quote your name, email address and sail number and I'll see if I have got anything half reasonable of your boat.